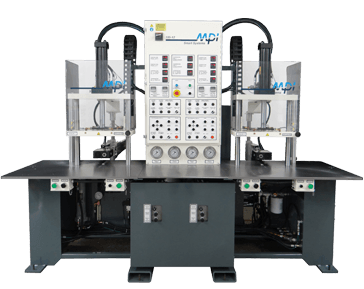 MPI offers the most sophisticated wax injection systems in the industry, generating higher casting yields, more patterns per hour, and increased productivity and throughput. Our wax-conditioning technology maintains a constant wax viscosity which produces consistent wax patterns, and our quick-change technology allows you to change dies in just 60 seconds, thereby minimizing transition times and maximizing throughput. All MPI systems come with our world-class technical support and training. Two 12-ton clamping units on a single frame, utilizing common wax conditioning, electrical and hydraulic systems. Independent wax flow control, wax pressure control and cycle time provide each unit with the ability to create quality wax patterns independent of each other. When injection cycle time exceeds pattern removal time, one operator can easily run both stations (two dies). This doubles your operator’s efficiency. Up or down nozzle replaces standard horizontal nozzle. Controlled pattern ejection is integrated into the lower stationary platen. Simple, one minute, die mounting with rapid hydraulic clamping of the die to the platens. Nozzle to die alignment is achieved at the same time. Exceeds CE requirements. The guard must be closed in order to activate auto cycle clamp and injection. Superior die temperature control. Each platen is separately controlled.